With many people having made making New Year’s resolutions to stop smoking, a new anti-smoking outdoor advertising campaign from Swedish Pharmacy Hjärtat set the city of Stockholm ablaze. The animated billboard was embedded with smoke detectors that sense when a passerby is smoking a cigarette. 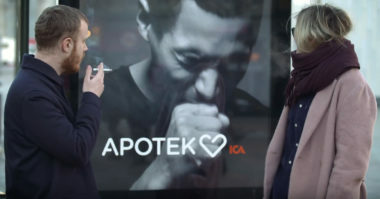 When the second-hand smoke is detected, the sensors prompt the billboard to show the image of a man violently coughing. This provocative billboard has been placed in a popular section of Stockholm where smoking is a common occurrence. To learn more about this animated ad campaign, The Mirror smoked out all of the details. The billboard has been stopping smokers in their tracks and their responses have ranged from shock to embarrassment to laughter. Many people have expressed the hope that the campaign will make smokers halt their habit, while others felt that there were larger problems in Sweden that deserved real concern and attention. And, some smokers were personally offended and believed that the billboard was just the latest example of the smoker-shaming trend. A video of the campaign with the responses of passerby has been placed on Pharmacy Hjärtat’s Facebook page. Whether the billboard convinces smokers to quit smoking has yet to be seen, but it will surely grab their attention because it’s definitely not blowing smoke about the health hazards of smoking. Get the latest look at what’s new in outdoor advertising. Contact MDG Advertising. MDG Advertising, a full-service advertising agency with offices in Boca Raton and New York, NY, is one of Florida’s top branding firms. MDG’s capabilities include print advertising, direct mail marketing, branding, logo design, creative, media buying and planning, radio and TV advertising, outdoor advertising, newspaper, digital marketing, website design and development, online video advertising, infographic development, email marketing, video marketing, mobile marketing, content marketing, social media marketing, paid search marketing, and SEO. To learn about the latest trends in advertising and branding, contact MDG Advertising.